Monthly Recurring Batches for Receivables, Payables and Inventory Batches. 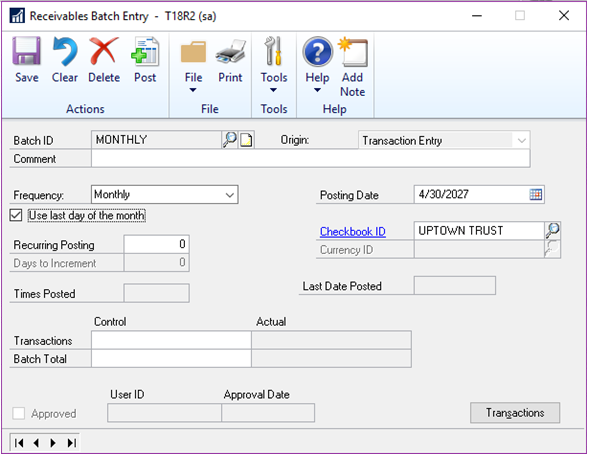 A new checkbox called ‘Use last day of the month’ has been added for Monthly and Bimonthly batches. When marked it will automatically set the posting date to the last day of the month. So, if the batch below is posted the next posting date would be set to May 31. This is great because before (and without the box checked) it would default the posting date to May 30.